Bonny Mallon grew up three houses away from the tracks of the Perkiomen Railroad. As a child, she remembers waving to the engineers as they made their way between Oaks and Emmaus. The tracks that paralleled the Perkiomen Creek as it meanders northwest to southeast through Montgomery County have all but been obliterated. But the passion for train travel that was instilled in Mallon all those years ago is as vibrant as ever. And in an interesting career twist, she is now on the receiving end of those waves from children. Mallon is a brakeman-conductor on the historic Colebrookdale Railroad, a former industrial line that now transports passengers between Boyertown and Pottstown. And according to Nathaniel Guest, Colebrookdale&apos;s founder and executive director, she is the first certified female brakeman-conductor on a tourism-centric train in the entire state of Pennsylvania. What&apos;s more, she&apos;s on her way to being engineer. 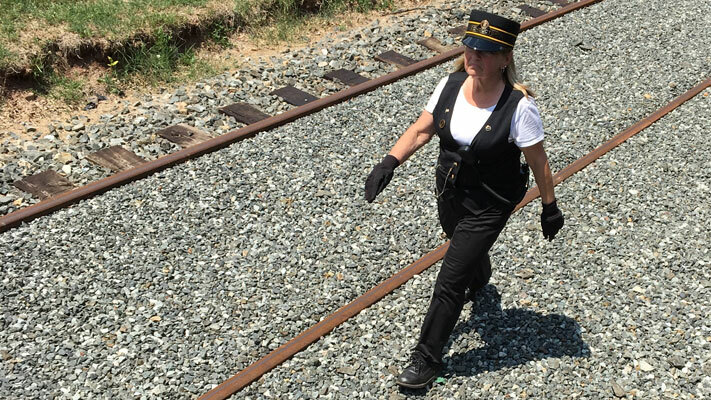 She is currently working her way through the extensive coursework necessary to throttle the engine on the nine miles of track through some of the most scenic open space in Montgomery County. "I&apos;m going to be moving into the cab and driving the train soon!" she gleefully explains. Mallon began her railroading life thanks to her son, who is also a Colebrookdale conductor. "He started volunteering there before the railroad actually got up and running, back in early 2014," she says. "And at one point, he told me they were short on hands, so he asked if I wanted to volunteer, too. I figured I&apos;d go up to the office and just stuff envelopes or something." She started with office work, but it didn&apos;t take long for her to graduate to the gatehouse, where she headed up ticketing. From there, she was put on the train itself as a car host. As her passion for the train continued to chug along, she signed up for brakeman-conductor classes. "When you become brakeman-conductor, you have to learn all the rules, all the characteristics of the railroad and the train," she said. "They give you a book that is like three inches thick, and you&apos;ve got to learn all this stuff. I had to learn every part of the engine: The generator, the amps, the wattage. You learn every part of that. And it&apos;s the braking, the throttle, the independence - all the stuff of the train. It&apos;s intensive." Following the classwork were 40 hours of shadowing an experienced brakeman-conductor. Completion led to her certification with the Federal Railroad Administration, an official agency under the U.S. Department of Transportation. "I love it," Mallon admits. "I really love being a conductor. The conductor is in charge of the train. Not the engineer. The conductor is in charge of that train and the people and the crew and everything. I check the generators and the marker lights and make sure the train is all ready and good to go. "Being conductor is a huge responsibility and I take it very seriously. But I love it. It&apos;s a blast." Mallon&apos;s enthusiasm for her work comes jointly from her fascination with the machinery and her ability to connect with the passengers. "My father was a barber," she says. "I spent a lot of time in his barbershop, watching him work, watching him draw people into conversations - or gauging when they might want to just be left alone and get their hair trimmed. I picked up a lot of his ability to work a room like that." As evidence, she recalls a 100-year-old man whose face lit up when she congratulated him on his birthday, which was being celebrated aboard the train. She also remembers reaching out to a shy girl who marveled at the sight of a female conductor. "She asked me ‘Could I do that?&apos; And I answered, ‘Sure! You can do whatever you want.&apos;"
Mallon is living proof of the magic that happens when work and passion unite. "Every run is different," she summarizes. "I don&apos;t care if you have the same people, same passengers, same crew, same everything. Every single run is different. "There&apos;s this one weekend in May, for example, that I call the ‘honeysuckle run.&apos; Because the honeysuckles are in full bloom, and the smell is just so good. "Or I go out on the evening runs. And I look up at the stars, and it&apos;s beautiful. And I see the deer and the wildlife. "I always tell people: My troubles just all disappear when I&apos;m out there."